1st quarterly meeting of ICT for Education group in Cambodia was organized with the collaboration between the Ministry of Education, Youth and Sport (MoEYS) and the Open Institute (OI), supported by the SPIDER program in Sweden. The purpose of this meeting is mainly to report and share information within 3 months period about the current state of each project’s organizations that have been implemented and with the special focus on sharing experiences of ICT-related education project (ICT4E) and establishing good collaboration between institutions that working in the same field. The meeting was held by the 27th of April 2017 at the IT Department of the MoEYS, in which 19ps include 2 females from 10 different national and international institutions attended. OI, Education Academy (Edemy), NGO Education Partnership (NEP), Kampuchean Action for Primary Education (KAPE), World Education Cambodia (WEC), Unesco, Education Support Center (ESC-Kizuna), Cambodian Children’s Trust (CCT), Voluntary Service Oversea (VSO), and the MoEYS. Mr. Sok Tha, Head of IT Department of the MoEYS, is very pleased and welcome for all participants. He suggested to invite openly through participant’s organization for those are working in ICT-related education sector in Cambodia that’s not part of the meeting today. By the end of year, the report will be written based on the organized meeting via quarter basis for education groups and allow us to understand more clearly both previous and current projects are implemented and sharing its best practical for future project education for sustainable in Cambodia. Established a policy / plan on the use of information technology and telecommunications in education (Master Plan ICT in Education). The master plan is currently being reviewed and updated. Developed textbook and curriculum on ICT in education for grades 10 to 12. Currently, OI support the MoEYS, on modernization of the system used by the ministry to monitor the improvement of the schools and to produce as fast as possible after monitoring them, feedback for the schools that will help them improve the quality of the education. By working with District Training and Monitoring Teams (DTMT), OI has assisted to developed a survey school improvement checklist via tablet, so that both teacher and officer can monitor and evaluate the program of improving the quality of each school on time and effectiveness and effectively. All data immediately collected via tablet will be sent to the MoEYS through a specialized dashboard, and allowing the ministry staff to understand the issues and needs at each school accordingly, as well as measurable better in advance. VSO has not much deployed ICT tools in education. A project VSO has been done with technical support from the OI, was to produce a video documents on basic teaching methods of English for grade 4, 5, and 6 at public schools where there is VSO target area. It is known as “Basic English Language (BEL).” VSO has no plan currently exist regarding the use of ICT in education. CCT is a local NGO working to rescue and strengthen the target group’s orphanage out of poverty in Battambang. CCT’s ICT-related education projects started since 2014 with the introduction of programming (website coding) and Robotics for public high school student and as well as training teacher in Battambang to have the required ICT skills. Develop an ICT literacy curriculum and ICT teacher training curriculum will be piloted in a formal and informal education at Monivoing public high school, Battambang province. Edemy, a social enterprise, sets up to provide service to teach English to students and teachers in rural areas using the Raspberry Pi from the UK. The program does not require internet connection (offline) by simply connecting with a PC / tablet devices that allow us to create teaching programs include a question and answer form of video tutorials and self-created content (contents). Students have to pay between US $ 2-5 per month 1 for learning English. NEP does not work directly with the student / teacher at the local level, but working as a network with national and international organizations that they work directly at grassroots level in the educational sector. NEP has not implemented specific projects regarding the use of technology, but it is studying on how to use the technology for monitoring the implementation of education project through its networking organizations in the future. VVOB in its new program “Strengthening Math Results and Teaching (SMART)” from 2017-2021. VVOB in collaboration with the Ministry of Education to help promote the program of initial teacher training for 2 years to 4 years (Bachelor’s degree), this new project and concentrate on updating / improvement in Mathematics (Mathematics) and mainstream programs, science, technology, engineering and Mathematics, or STEM students to stimulate interest and to better understand the direct experience of science. 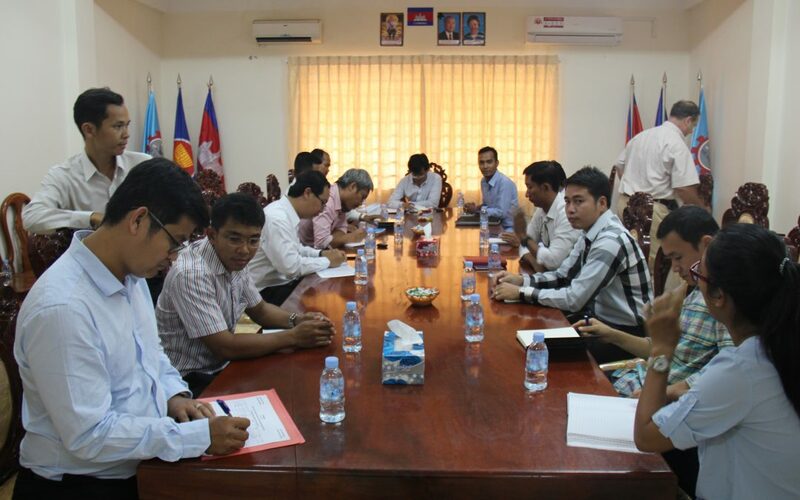 The program will begin testing 2 region with Phnom Penh and Battambang province and continue to be implemented in the other 2, Kandal and Kampong Cham. ICT-related education projects so far, with the cooperation with OI, VVOB has produced a series of video lessons (youtube) related to science. For some courses of science subject, for example ‘space’, that is a very difficult to explain the reality of learning content. This compilation video file allows students to understand better than imagination. World Education Cambodia (WEC) focus to promoting education both formal and non-formal education across the country. The WEC has also been recognized as an organization that has mainstreamed the use of technology in education, projects with financial support from USAID program started learning app for children and another app for teachers to be able to assess and score automatically reading of the children at the kindergarten level. To encourage use of these two Apps WEC training for teachers as well as providing material for about 1300Tablets with approximately 130 schools across the country so that they can continue to practice the students in their schools. Technology for Education Systems Transformation (TEST) was 1 component of Total Reading Approach for Children (TRAC) 2012-2014 in the Learning to Read in Early Grade program of WEC to lower rate of illiteracy through using technology to further improve and create culture of reading skill in early grade program. Harnessing Technology for youth learning and safe migration through teaching youth to use internet and as well as IVR phone line. Kampuchean Action for Primary Education (KAPE), working primarily in the education system in the country, and has been operating in the country. With the cooperation with the MoEYS since 1996. Currently, KAPE has worked directly with 165 schools in 11 provinces in the country. Project E-books for English (E4K) is one of 15 projects that are being implemented in the country. E4K project has been implementing activities in the province and Khmom with the main goal is to develop books based on different abilities of students through electronic devices, development, test clips included in the book to read electronic creating ways to introduce about teaching students meet the requirements for class reading and distribution of books Electronically through the participation of partner social enterprise learning resources. Sor Se Khmer, is a Khmer writing app in collaboration KAPE and InSTEED, supported by SPIDER. It is created to help primary children improve Khmer writing, vocabulary, and speech. Children Digital Library is to increase children’s access to quality reading material through the use of electric tablet and eBook app. Education Support Center, “Kizuna,” is to improve the quality of basic education, as well as promoting the economic development of the rural people in the country since 2008. 2nd project is to create classes in English on the radio (Youtube). In regard to education, UNESCO has been piloting 1 project to improve the basic education system, particularly focusing on the teaching of English at grade 7, 8, and 9 in Phnom Penh and Siem Reap. This meeting is given UNESCO very resourceful to mapping out who do what and which best experience’s project should be learnt. UNESCO is also seeking collaborative partners for next phase of the project.